What do you do when both your parents are drug addicts, when even though they are separated there is no escape from the misery you feel? For sixteen-year-old mixed-race Jayson Porter living on the eighteenth floor with his physically abusive mother in the Florida projects is the worst kind of hell. His only freedom is going to Graham, the well-to-do school his mother's friend Trina put him up for a scholarship for, his friend Trax and April his first real girlfriend. When Trax dies and Jayson's father decides to break his years of silence and tell him the truth about his mother the railings on the eighteenth floor start to beckon and Jayson sees how easy it would be to stop the pain... But the pain is not so easy to get rid of and now even more dependent on his mother than ever Jayson turns to the one person he knows will save him. There are many books out there for teenage boys, tales of adventure and fantasy but there are few books out there that talk about the reality of teenage life. That is until Jaime Adoff. If Marie Lamba is the champion of teenage angst for girls then Jaime Adoff is definitely the male equivalent. 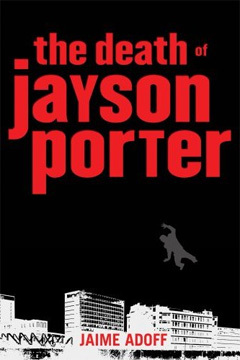 The Death Of Jayson Porter by Jaime Adoff is available to buy now.